Look here for a great glazed strawberry pie recipe, one of many really good, easy, fresh strawberry pie dessert recipes on this site! A pie that looks as good as it tastes! This no-bake strawberry pie recipe is one of the best strawberry pie recipes around! You'll be especially happy with it if you've been searching for a recipe for a Shoney's Restaurant-brand strawberry pie. To make the glazed strawberry pie's filling, mix together the 1/2 cup of sugar with the salt and strawberry gelatin in a bowl that can properly hold boiling water. 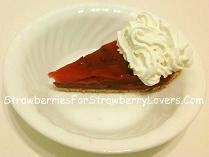 Obviously, if you have been searching for a glazed strawberry pie recipe using strawberry Jello-brand pie filling, just choose strawberry Jello-brand gelatin for the strawberry gelatin in this recipe (many people look specifically for Jello-brand recipes, so if that's you, hopefully adding this little bit to the page helped you get here). Next, heat the cup of water to boiling. Then, being very careful of the scald hazard posed by the water, pour it into the bowl with the dry-mixed ingredients. After the dry-mixed ingredients are fully dissolved in the water, begin adding the cornstarch, a little at a time, until it is fully dissoved, too. After finishing the pie glaze, remove the pie crust from the refrigerator and give it a thin coating with the glaze. Next, begin to place the strawberry slices into the crust. Lay the slices flat against the bottom of the crust, moving around the bottom of the crust's side, with the tips of the strawberries pointing inward towards the center of the crust. After making a ring around the bottom of the pie crust, make another ring inside the first one, then another, until the entire bottom of the crust is covered. Pour a thin layer of the strawberry pie glaze over this layer of sliced strawberries. This layer of strawberry slices covered by a layer of glaze makes one layer of pie filling. Make a second layer of pie filling in the same way as you made the first one. Then make a third. Add any remaining glaze to the pie after the third layer of strawberry slices has been added, then set the pie in the refrigerator. When the glaze has finished setting up, the pie is ready! A bit of whipped cream may be used to garnish slices of the pie for serving, if desired. It is recommended that this pie be kept in a sealed container and eaten fairly quickly after making since the pie filling will gradually dry out. Keep the pie refrigerated (do not freeze it, since freezing will destroy the texture of the strawberries). Nothing compares to a really good, fresh, crust-recipe strawberry pie! Enjoy one of these strawberry treats soon! 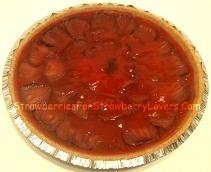 And please remember that you learned how to make this glazed strawberry pie recipe here at StrawberriesForStrawberryLovers.Com, Home of the World's Happiest Fruit!